(USAToday) --- For the second consecutive day Thursday, Grambling players boycotted football practice. And about the same time that practice was scheduled to be under way, the school announced that interim head coach George Ragsdale had been reassigned within the athletics department. School spokesman Will Sutton also said defensive coordinator Dennis "Dirt" Winston would replace Ragsdale as interim head coach. "Ragsdale has been reassigned and to go in another direction at this time, and he'll be helping in other ways," Sutton said. Winston is Grambling's third coach in five weeks, as Ragsdale ends his short tenure at Grambling with a 0-5 record. He took over for Doug Williams after the legendary coach and former player was fired Sept. 11. Jackson State spokesman Dennis Stringfellow told The (Jackson, MIss.) Clarion-Ledger on Thursday afternoon that Saturday's game between Jackson State and Grambling would be played as planned. Zena Lewis of the Southwestern Athletic Conference told the Clarion-Ledger earlier Thursday that all four SWAC games scheduled Saturday are expected to go on as planned. Sutton said no changes have been made for Saturday. "No concern," he said. "We're going to play the players that want to play." Sutton said athletics director Aaron James will decide where Ragsdale is reassigned. Ragsdale wasn't sure what that meant, but did know he will report to James at 8 a.m. Friday. "I was hurt. What do you think?" Ragsdale said when reached Thursday night. "I'm a football coach. You can reassign me, but I don't want to make any waves. 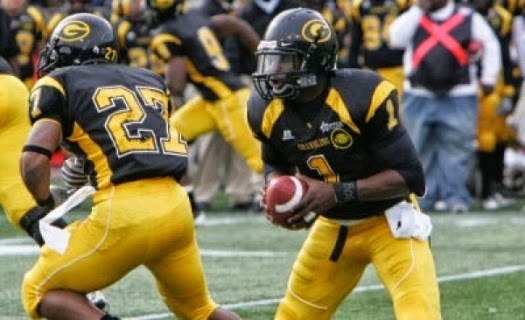 My plans were to restore Grambling back to its old days. I guess they couldn't wait." In a news release, James showed his support of Winston and said he "can't think of a better choice" to lead the Tigers. "He can tone things down and get the program up and running smoothly while empowering our football players to be successful," James said. Sutton said the team was supposed to hold a closed practice at 7 p.m. ET, but Winston and team members were seen leaving the intramural facility shortly after the top of the hour. The players made no public demands of what they wanted during the boycott, but safety Naquan Smith gave a surprising admission Thursday during a public demonstration by Grambling students. "As a team, we feel like we wanted (Ragsdale) to actually step down," Smith said. "(The team) is behind us because they know what we've been going through. They know the struggle. We said we're behind each other 100%." Ragsdale had been promoted last month from running backs coach after head coach Doug Williams was fired. Amid all that, questions arose about whether Grambling's game Saturday at Jackson State would be played. Smith said the team is "prepared to play" Saturday, but he gave no guarantee that the team will make the trip. "We want to know that the program is going to be run the right way," Smith said. Grambling is 0-7 this season and has lost 13 SWAC games in a row and 17 in a row against NCAA schools. The Tigers won a SWAC title as recently as 2011 under Williams, who played quarterback at Grambling in the 1970s under legendary coach Eddie Robinson. Players' frustrations boiled over Tuesday night when they walked out of a meeting with school administrators, including university President Frank Pogue and athletics director James. Pogue and James had planned to meet with the team since firing Williams on Sept. 11 and discuss the state of Grambling football, but that meeting didn't happen until Tuesday, more than a month later. "Things are rough, and we understand our players' frustration," Grambling spokesman Will Sutton said in a statement Wednesday night. "The president is frustrated, the AD is frustrated, the students are frustrated, the alumni are frustrated, so we fully understand our players' frustration." After the meeting, one of the players, walk-on receiver Adrian Manning, told The (Monroe, La.) News-Star that "no one is talking to that snake," in reference to Ragsdale. Players' complaints included the firing of Williams just two games into the season, the rundown state of athletics facilities and the fact the team had to ride buses roughly 1,200 miles round trip for a game in Kansas City, Mo., and 1,500 miles for a game last week in Indianapolis. "We felt like we've been mistreated," safety Smith said Thursday after he addressed a student rally. "The administration is finally addressing some of the facilities issues, but we felt like it should have been done a long time ago. "We felt there is a lack of leadership with the administration. We had a personal issue with (Ragsdale) and demanded for him to go. We want (Pogue) to go."